Amaferm® is research proven to increase digestibility on not only starch, but many different forage qualities and types. 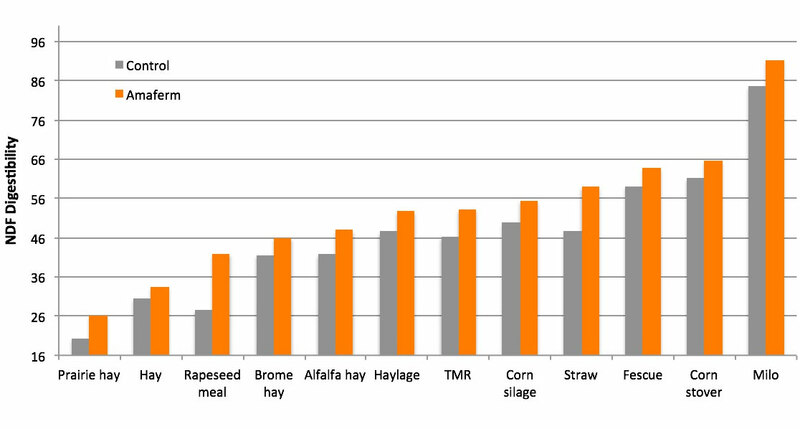 This increase in digestibility matters, as every 1 unit increase in NDF digestibility is associated with a .17 kg increase in dry matter intake and a .23 kg increase in milk production (Oba and Allen, 1999). Feed is usually digested from the inside to the outside because the outside has a waxy cuticle layer that makes bacterial attachment needed for digestion difficult. This is one of the reasons why alfalfa, which may have more lignin than a grass, but which is hollow-stemmed, and breaks apart easily during the chewing process, may have a more rapid digestion than a grass which is flat and must be broken into sections for bacteria to attach. Amaferm® has been shown to accelerate both the rate and extent of fiber digestion through increased growth of Neocallimastix frontalis EB188, thus functioning like a prebiotic in stimulating the activity of the fungi and the bacteria leading to more digestion. Multiple studies have shown that Amaferm® increased dry matter digestibility on average by 9% and NDF digestibility on average by 17.3%. Total tract digestibility provides confidence that Amaferm® impacts digestibility in more than just the NDF component of the diet. A study conducted by Gomez-Alarcon in 1991, showed that Amaferm® increased NDF, ADF, dry matter, organic matter and crude protein digestion. The extent of dry matter digestibility is a crucial determinant of the nutrients utilized by the animal. Amaferm research has shown an average increase in dry matter digestibility of 9%. Dry matter digestibility provides confidence that Amaferm impacts digestibility in more than just the NDF component of the diet. Sources: Beharka and Nagaraja, 1993, Campos et al., 1990, Chen et al., 2004, Chiou et al., 2000, Gomez et al., 1990, 1991, Nocek and Jensen, 2009, 2011, Varel et al., 1993, Westvig et al., 1991.